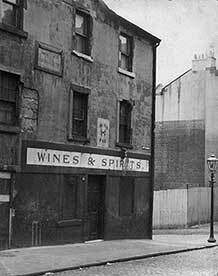 The Old Cross Keys sat at the corner of Rottenrow and Weaver Street. It was said that a date of 1796 adorned the premises. That would probably be quite accurate as the old tenement building was very old indeed. The old building was erected in 1795 and became a licensed house the following year. It was the property of the Incorporation of Weavers, who purchased it from the Crawford's of Jordanhill. The memory of several well known members of the Incorporation were preserved on tablets on the walls, one was the grandfather of Mr. Alston, of Duke Street Prison. The house was rebuilt in 1795 on the ruins of what was the dwelling house of one of the fourteen prebendaries of the Glasgow Cathedral. Neither the exterior or interior of the old pub was altered in years. The old kitchen and sitting room as right next to the bar. A large room where dancing was held in the old days, the old North Quarter Society used to hold their meetings there. 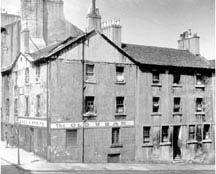 William Stobo took over the old pub in 1848 and lived next door all his life with his family and wife Jane. Their son David took over the licence when old Mr Stobo passed away, he trained as an Iron Turner while his sister Jane was a Machinist to trade. The Old Cross Keys c1960. There was a quaint old rhyme which adorned one of the rooms, it was entitled Lament for the Gutty Steeple, and began "A' ye wha in the north do dwell, Frae College hall to Campsie Fell, A tale of woe to you I tell, Na mair ye'll hear St. Mungo's Bell, Ring in the Gutty." David Stobo continued as landlord in the Old Cross Key's until 1901. Edward Gallagher then acquired the licence and continued in the pub just before the Second World War broke out. One of the barmen in 1952 was a gentleman called Tommy Hoey. Francis Timoney then took over the pub until the 1950s. The last licensee was a gentleman called Bernard Murphy. The pub was closed in the 1960s and demolished shortly afterwards.